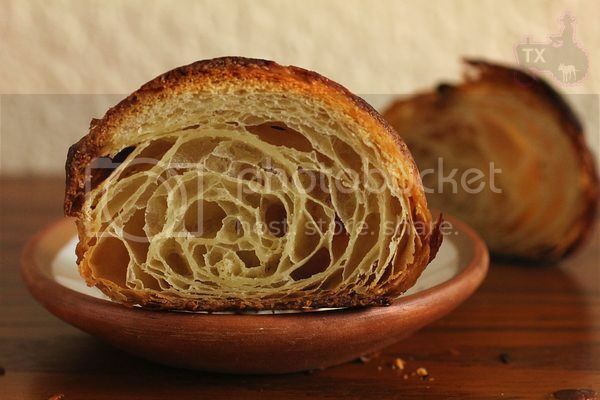 However, making croissant in warm weather is "mission difficult", not "mission impossible", the following are some tips I learned in the past month, I hope they will be helpful to my fellow warm weather TFLers. 1) Avoid direct sunlight. My kitchen has huge windows, and the counter space that's large enough to roll out the doug is right by the window. Under direct sunlight, the temperature could shoot to 90F in no time. My husband jokingly calls me "cold blooded" since my hands are always freezing cold, however, the few times when I was rolling out dough under the sun, my hands quickly warmed up -- so did the dough. Not a good thing. Lately, I have figured out the optimal schedule: Sunday at 5pm, mix dough and put in fridge for 2 hours; make butter block during that time; at 7pm enclose the butter and do the roll out. The temperature at 7pm is uaually still 28C (hence the picture above), but since the sun is on the way down, it won't keep heating up. After that just follow the schedule and do two more folds, usually I am done by 9:30 or 10pm. Next morning I usually get up early to run, so I do the final roll out before/during/after the run. 5am is the coolest time of the day, which is still around 24C/75F, but that's the best I can get. Usually by 7:30am, after resting a few times in the fridge, I can finish shaping. I usually freeze half for later, and put the other half in fridge until after work to bake. 2) Use the right butter. Not all European style butter are created equal, even if they have the same butterfat content. I have tried 4 or 5 different brands, when it's cooler (like a month ago), most of them would work, but now, only Plugra gives me consistent results, other brands are simply too melty. 3) Use the right rolling pin. I use a heavy duty metal rolling pin to make up for the lack of arm strength. However, lately, when it's this warm, I find it's necessary to put the pin in fridge along with the dough. At first I put it in freezer, thinking "the colder the better", nope. 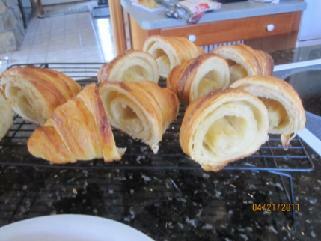 It was too cold for the first two folds, butter simply broke between dough layers, creating uneven crumb. Now I put it in fridge for the first two folds (when butter layers are still thick), freezer for the last fold and final roll out (when butter layers are thin and easier to melty but less likely to break). 4) Only work on the dough a few minutes a time, and put it in fridge more often than you would expect. That's the most important thing. When it's this warm, time is not on your side. Several times I tried to push my luck and roll the dough for a bit too long - warm dough == melty butter, never fails. This is where practicing comes in handy - at first I can't roll out much in the 3 to 5 min time span (longer for the first two folds when butter layers are thicker, shorter time for later folds and rolling out), which means the whole process drags on forever since the dough has to be in and out of the fridge many times. However, as I practice more, 3 to 5 min is more than enough for me to roll out the dough completely. For the last fold and final roll out I still let the dough rest in fridge once during rolling just so it's relaxed and easier to roll, but for the first two folds, it's all done in one shot. Other than dealing with the warm temperature, I am also adjusting the formula to get more flavor. I replaced the poolish in previous attempt with 100% white starter. Since there's still dry yeast in the final dough, I though it would be an easy switch - not so. Starter is more acidic than poolish, which made the dough too soft. I then mixed it longer and reduced hydration slightly. Got the even layers with no butter leakage, however, the crumb is not open enough, indicating that the dough gluten is still too weak (shown in the following picture). So I changed the AP flour to Bread flour, KAF bread flour at that, which has very high protein level. To my surprise the rolling out was not as impossible as I expected (or maybe I have practiced enough so it seems easier? ), but the crumb became a lot mroe open (shown below). 1. Mix everything but the rolling butter, knead until gluten starts to form. In my KA mixer, 3min at first speed, 4 min at 3rd speed. Then following the procedure illustrated here. 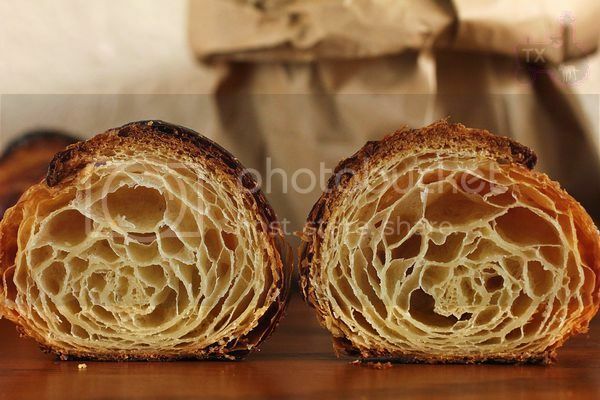 My ideal croissant has very open, but even crumb with honeycomb holes, and thin walls. Still not quite there yet, but heading in the right direction. The addition of starter in the dough adds another dimension of flavor. When I brought some to my coworkers, who has no knowledge about yeast/starter, they all much prefer the starter version. Sometimes I would make some chocolate ones, those are always gone first. The temperature is still rising here in TX, let's see how far into the summer I can keep up this crazy croissant project. Pretty darn nice txfarmer! Glad you found a way to incorporate starter into the mix. I just picked up a sheet of marble to use when rolling laminated doughs. I'll have to try your new formula/procedure. Beautiful. 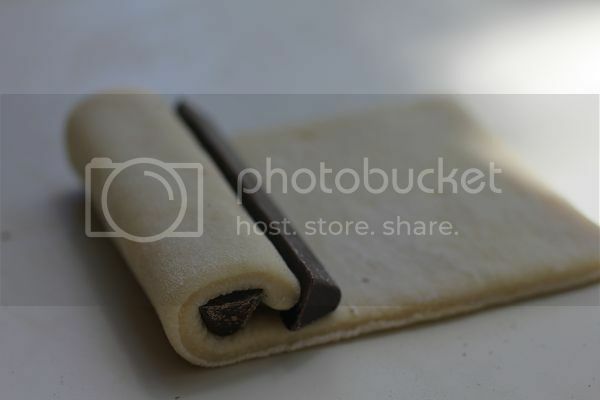 I have been debating about getting a marble sheet - really don't want yet another piece of heavy kitchen tool, but so many people say it's great for making lamination doughs. 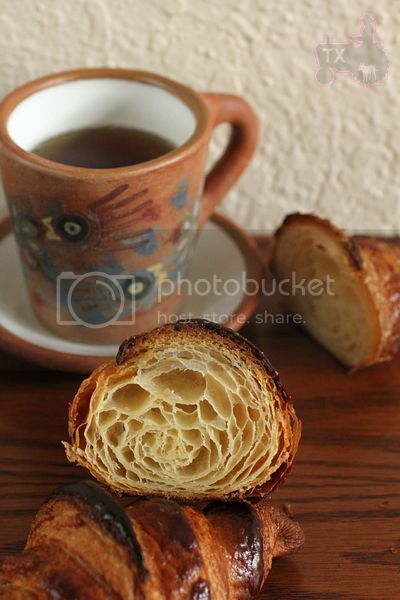 Delicious, and I can only imagine how hard it would be to make croissants in a Texas summer. The worst of the summer is still yet to come, I kinda dread it. Baking these in TX humid hot weather certainly is a feat you have overcome! Your results are gorgeous. What lucky co-workers getting to sample and judge 'la difference' excuse my french :-) Thank you for the nicely written results and beautiful photos! I would love to see what you can do with high altitude baking. I have lived in a lot of place, coincidently, all of them are at sea level, haven't had a chance to experience high altitude baking yet. Superb looking lamination in your pictures. I've tried making them up here in Virginia during the summer and it's really a challenge unless your kitchen happens to be a walk-in cooler, which mine isn't. When you do a thing, you sure do it beautifully ! I marvel at your dedication to "getting it done right". They look beautiful and delicious, I am very impressed! Your pictures and notes are first class, too. Beautiful pictures. I am impressed by your perseverance to attain perfection. This is reflected in all your blog enties. 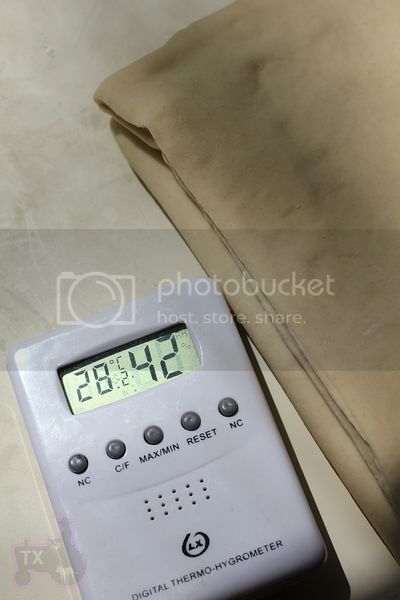 I know what a lot of adjustments need to be made to bake in hot climate(It is 41deg C where I live). Good luck! What can I say? 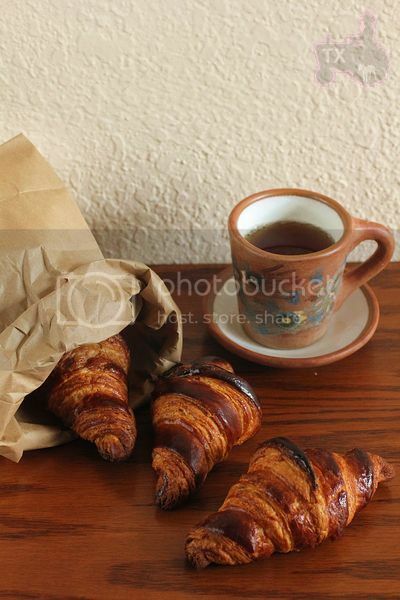 Beautiful pics and most importantly, exquisite croissants! Makes total sense - with TX summer, the oven outside could save a lot of energy! Early settlers in Texas came up with that solution. The Texas house or the dog-run house was common from the 1850s until A/C became ubiquitous. Notice the breezeway. For the summer, the stove would be moved from the kitchen to the breezeway. So, too, the kitchen table and even the beds. In the early fifties, Grandma's breezeway was the best place to sleep when staying over in the summer. Back on topic, your blogs are always a must-read for me. They are totally frustrating, as even your rejects would be something I'd grin myself silly were I to produce them myself. Woah, way impressed with the diagram, even has measurements! 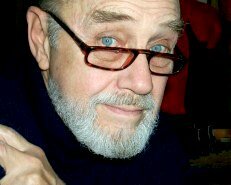 Wow, Txfarmer!! You made such super perfect croissants. I will study your formula. 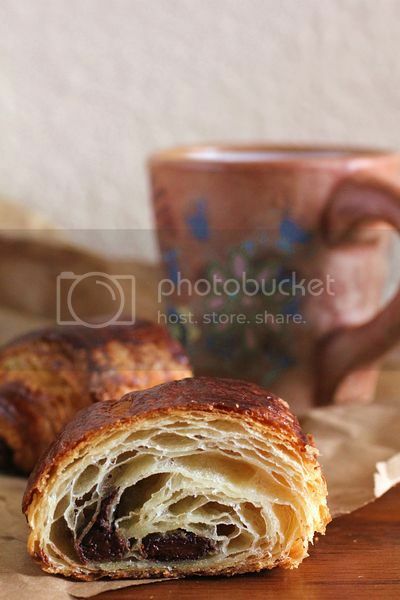 Thank you for posting your another great croissants! I totally agree with your shaping point :Don't roll the croissants too tight during shaping: This is the result of shaping the dough tightly. That was a shocking moment. Actually from the pictures, I don't think tight shaping was the problem. I am guess butter layer was uneven, some leaked into the dough layers (hence the ones stuck together), and the super thick ones created the big gap. Thank you for your observation, Txfarmer. I put the final dough in a refrigerator after mixing to ferment for 24 hours. I also put the shaped butter in the refrigerator for 24 hours, too. I don't remember but the butter was too cold for the dough, I wonder.. Thank you for the advice. I made another bad one on 21th April. I didn't take the picture of the other ones ( or I can't find the picture )that were edge's dough and I didn't stretch nor roll them tightly. They were airy crumb. That is why I thought that the first one was the same problem. I appreciate your generous advice. Thank you, Txfarmer. look so perfect to me! I don't know what I'd give to make mine look like yours! Wonderful croissants! I live in Brussels, one of the domains of the French culinary tradition, but even here it is not easy to find more perfect croissants. My congratulations! Ah, I am so flattered, thank you so much for the affirmation! All a feast to the eye, Txfarmer. 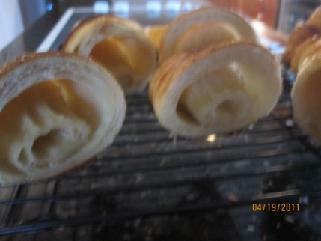 As Nico said, even th "defective" ones are my next target.. if i bake croissants ever again. Pictures, writeup, Notes are all great.. Thank you! Well, txfarmer, I hope you took advantage of this weekend's temps in North Texas to bake lots of laminated breads. It's been cool all weekend, and I awoke this A.M. to 46°F. Brrrr! I was elbow deep in flour/butter while it was hailing/storming outside. Got everything shaped this morning, will baking tonight! They look yummy! Don't know if you can get it in the US but in Europe the dough is typically made with a special type of butter (actually I don't think that technically it's 100% butter) which has a higher melting point than normal butter and is A LOT easier to handle, especially at higher temperatures, yet still delivers a good taste/mouth feel. It's not easy to find, I purchased it over the net at a shop which sells specialty baking products. All regular croissants/puff pastry are made with this. While living in Brussels my neighbour was an artisan baker and during the week this is what he sold. Pure butter croissants were available on sundays only exactly because by his own admission the dough was the very devil to make during summer. (nowadays 95% of bakeries purchase pre-made dough sheets). Am in India now and except -maybe- during december-january making croissant dough or puff pastry dough isn't an option due to the temperatures. Perhaps not such a bad thing either, long distance running and croissants are not a match made in heaven. Your croissants are fantastic. I 'a year that I try to make croissants, have a obsession for me. I got an acceptable result but I still have some problems. 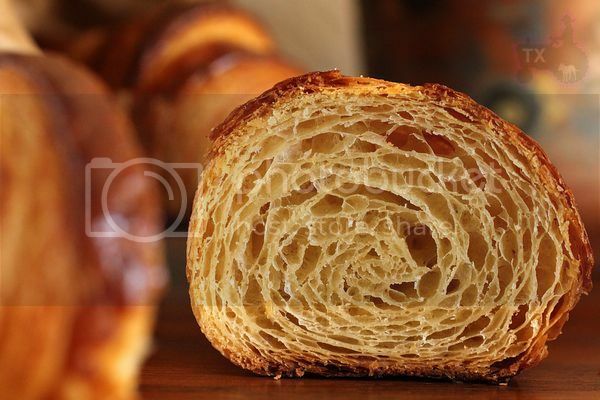 these croissants are baked at 200 degrees centigrade in a convection oven for 10 minutes + 10 minutes at 180 ° celsius. If I go over the tips of croissants burn. insererire more butter to the dough in my view makes cooking more risky. The layers are heavier than for the highest amount of butter and will be harder to raise the dough, and find well-defined layers. If too little bake the croissants collapses when it comes out of the oven and find the layers under very attached to each other. 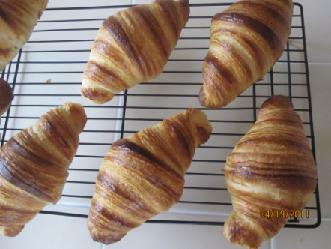 As you can see you always have the lower part of the croissants not very defined, not as I would like. I struggle to find the right compromise. In the picture you see what came better but someone below was closed and once baked has slumped. 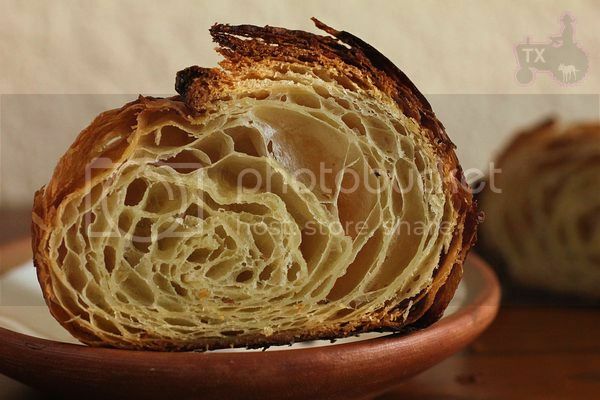 Do you think the croissants needed to be cooked more for not drop / fall outside of the oven? Or maybe you would need to cook at a higher temperature? day 2 hours 21: forming croissants. Still fridge. 24:00 start to rise for 7 hours. sorry for this long message! Hi!! Is it possible to not use osmotolerant instant yeast?? just WILD YEAST from the STARTER??? :) or what should I use instead? Hello...I know it's been a couple months since you asked the question, but osmotolerant yeast can be replaced with other forms of yeast. It's just a stronger yeast that holds up to sugars better than normal yeasts. You can get the right effect by using regular instant yeast. Just multiply the amount needed by 1.3 to get the amount you need. So...if 1 ounce of osmotolerant yeast was needed, 1.3 oz of regular instant yeast would be the substitution. Hello TXFarmer, thank you very much for these detailed recipes and pictures. 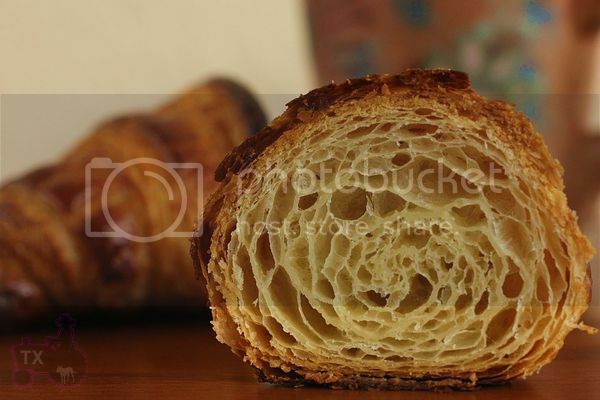 I would like to try the croissant recipe, but I have a quick question about the white starter. 100% white starter means hydration 100% and just bread flour, right? If not, for the 320 grams of starter for the croissants, can you please tell me the proportions/grams of flour, water, etc. I tried your 36+ hour sourdough baguette recipe, it was fantastic. It was worth waiting so many hours. :) thanks again. 2) Since my environment is hot, I resorted to having the dough in the fridge at least 1 hour instead of 1/2 between each fold. I also sometimes put it into the freezer. 3) Unlike most recipes that call for the first fold immediately after the butter is folded in, I put the dough with sealed butter into the freezer before the first fold. 4) Try not to kneed the dough before sealing in the butter. This is very important because you won't be able to stretch the dough out easily once gluten has started developing. 5) Try to roll your butter out as thin as possible. This will help with the first roll out of your dough before your first fold. I found that if you had it as thin as possible then life was alot easier once the butter was sealed. 6) Leave around 25mm/ 1" border during the sealing. This will allow some space for butter to spread when you roll out the dough. If you leave too little space it will squirt out or tear leaving a huge mess and oily dough. Once this happens it will be really hard to roll. 7) Make sure your counter is well floured and not wet. During the rolling out process you want the dough to glide over the surface and not get stuck to it as this will result in tears. Hope all this helps and good luck with your croissants!